Saint Matthew’s School is a Catholic school in the Diocese of Richmond. The Richmond diocese was the first in the nation to be designated as a Catholic school system by SACS CASI as a result of the schools’ high standards and commitment to continuous improvement. Most importantly though, the diocese also lays the religious foundation that Saint Matthew’s School embraces. This encourages an atmosphere of morality, integrity, and service to others. While this environment is Catholic, Saint Matthew’s is open to children of all faiths. –Liturgy: Throughout the school year, the students come together to celebrate the Liturgy. Parents are invited to attend and pray with us. School liturgies are celebrated weekly. –Religious Instruction: Religion is taught as a formal subject in grades Pre-K through 8. 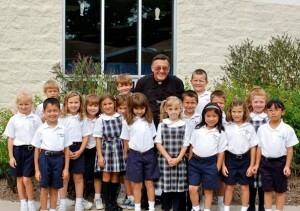 St. Matthew’s School encourages the students to grow as Christians. Remember, it takes parents’ involvement to shape children’s spiritual life. –Prayer: Before classes begin each morning, the school gathers for prayer. The Pledge of Allegiance follows morning prayer. Children pray in their classrooms before lunch. Prayer also concludes our day. –Penance: Students will be given opportunities to receive the sacrament of Reconciliation as scheduled by the individual parishes. –Perpetual Adoration: Opportunity for adoration of the Blessed Sacrament is available 24 hours a day in the chapel adjacent to the Parish Office. –Prayer Garden: A grotto in honor of Our Lady as well as representations of the Stations of the Cross may be found in a garden setting between the school and the church. 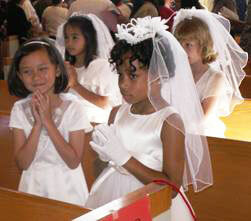 –2nd Grade Sacramental Programs: Sacramental preparation is provided through each student’s individual parish. Students who belong to St. Matthew’s Church must register for the sacramental preparation through the parish office. At St. Matthew’s parish, First Reconciliation classes must be attended before First Eucharist classes. Information concerning times for these classes may be obtained by calling the parish office. Please visit http://www.saintmatts.net/ for further information about Saint Matthew’s Church.